The Yancheng Rare Waterfowl Nature Reserve is 40 kilometers from Yancheng and covers an area of 453,000 hectares. Its center is the 17,400-hectare area between the estuary at Xinyang and Doulong Harbor. It is the first of its kind in China and has been selected as part of the Man and Biosphere Program of UNESCO. The zone abounds in water and grass resources and has ample aquatic animals and plants. It has a nice shoal scene and comfortable natural environment. The zone is home to nine animals under class-one state protection and 32 animals under class-two state protection. 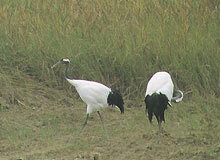 Less than 2,000 red -crested cranes exist in the world today. But each year, 1,000 of these come to the reserve in winter, in the winter and spring, red -crested cranes hover in the air while others play or dance in the reed fields. Their red crowns glitter under the sunlight like rubles in a crown. The reserve also welcomes white cranes, white-naped cranes, white storks, black storks, wild goose and ducks, about 100,000 birds of some 260 types. A breeding center involved in domesticating more than 30 cranes, 200 ostriches and several hundred peacocks is being operated. This is truly a kingdom of birds.